Based in Eugene, Oregon, Vtopian Artisan Cheeses produces delicious exclusively vegan artisanal cheeses. All products are dairy-free, vegan, organic whenever possible and handmade in Eugene. Imber and Mark, the sweet couple behind Vtopian, recently completed a successful Kickstarter campaign intended to help grow the brand. They are currently working hard to expand their distribution and introduce new product lines. In addition to the current lineup of cheeses, Vtopian has just released their new cheese wedges this fall and we are excited to be sharing them today. Vtopian brie, cheddars wedges, feta and cheeseball are all available for delivery throughout the United States. Vtopian brie and cheddar bricks can also be found online at Vegan Essentials. Cheese spreads are currently only available locally. Read here or check their Facebook page here for a more updated stockist list and updates on distribution. A Cheeseball, a real vegan cheeseball! This is genius! This Mapled Seitan Cheeseball is comprised of a soft, creamy cashew and soy cheese interior coated in crushed walnuts, maple and seitan. This is nothing short of pure decadence. This is a real crowd pleaser and won’t last long once you share it. We’ve already ordered our next one for the holidays! I think what we loved about this one was the fact that the mapled seitan is like a sweet, salty and smoky jerky. We’re so fond of the combination of sweet, savory and smoky flavors that this one was an instant hit. The most unique cheese in the Vtopian lineup. The Cheeseball contains soy & gluten and is sold in three sizes: Mini me 4.5oz, Me 9oz and Double Me 18oz. 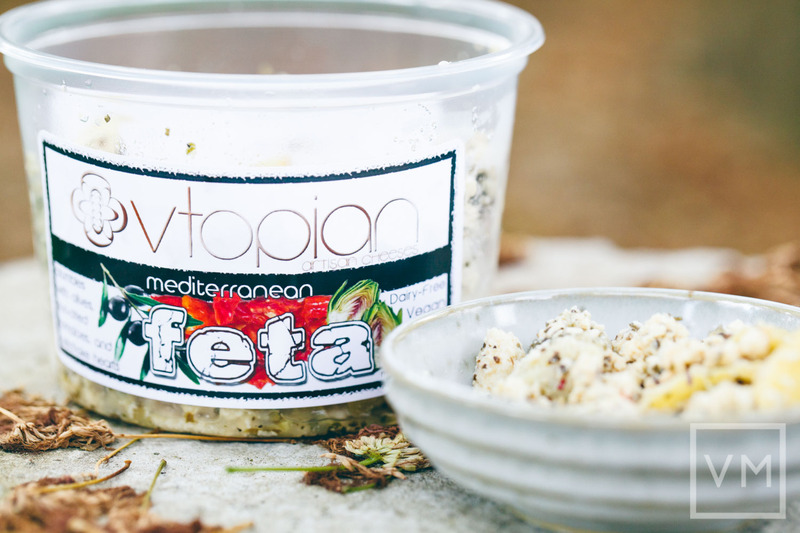 Vtopian Mediterranean Feta contains crumbled organic tofu mixed with organic herbs, artichoke hearts, organic sun dried tomatoes and organic Kalamata olives. It was pretty tasty, savory and packed with delicious herbs including rosemary, oregano, and basil. This cheese has a nice briny flavor that pairs so well with any type of fresh salad or Mediterranean-style dishes. 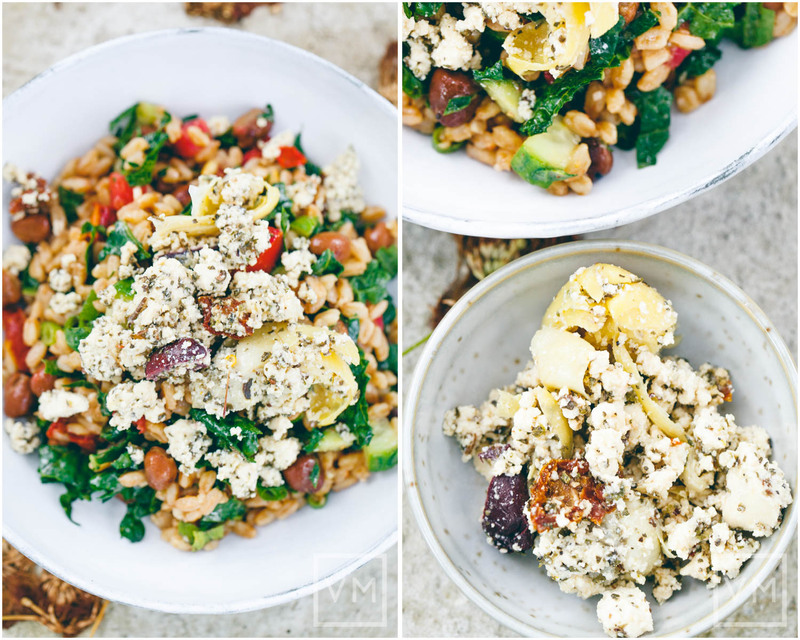 We used their feta in our Mediterranean-style Farro Salad with Fava Beans (view the recipe here). 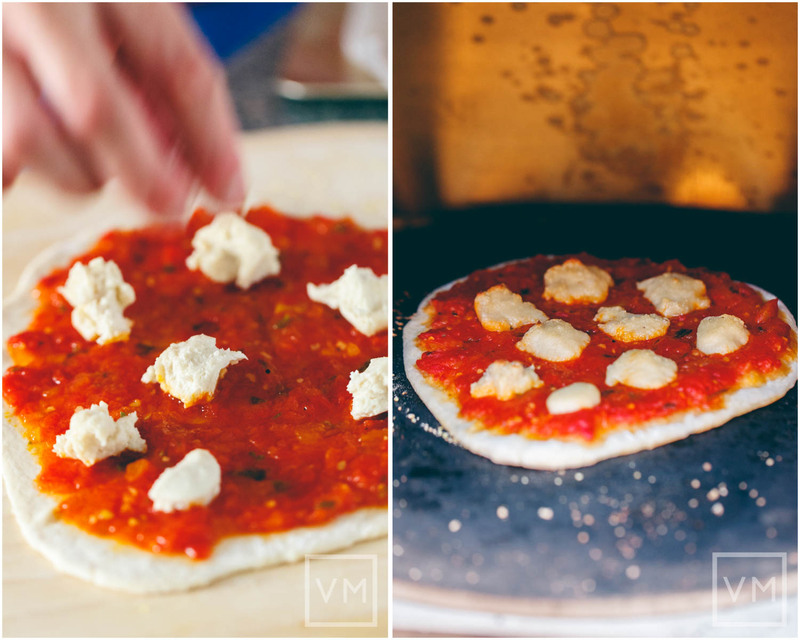 Vtopian offers two varieties of spreadable cheeses, Creamy Basil Borealis and Roasted Red Pepper Surrise. 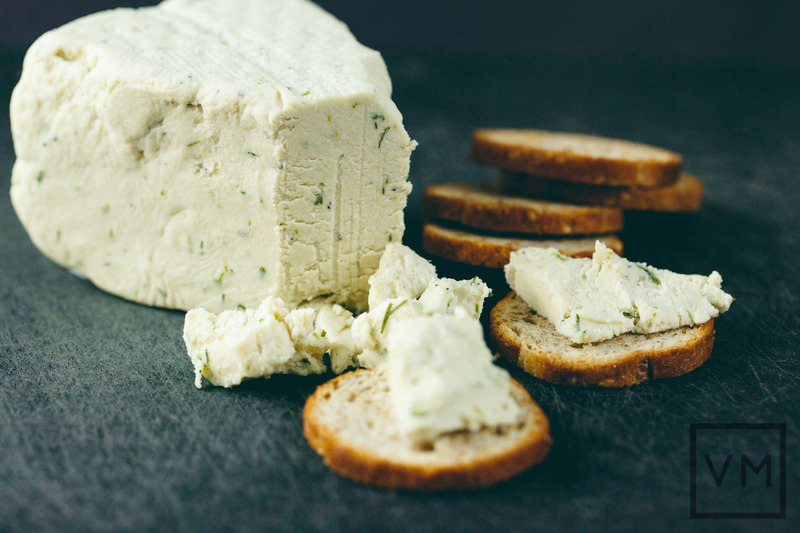 These tofu and cashew based cultured spreadable cheeses are gluten-free and sold in 5.5 oz containers. Vtopian cheese spreads are currently only available locally. Add these to your favorite tomato sauce for an instantly rich and creamy pasta sauce. 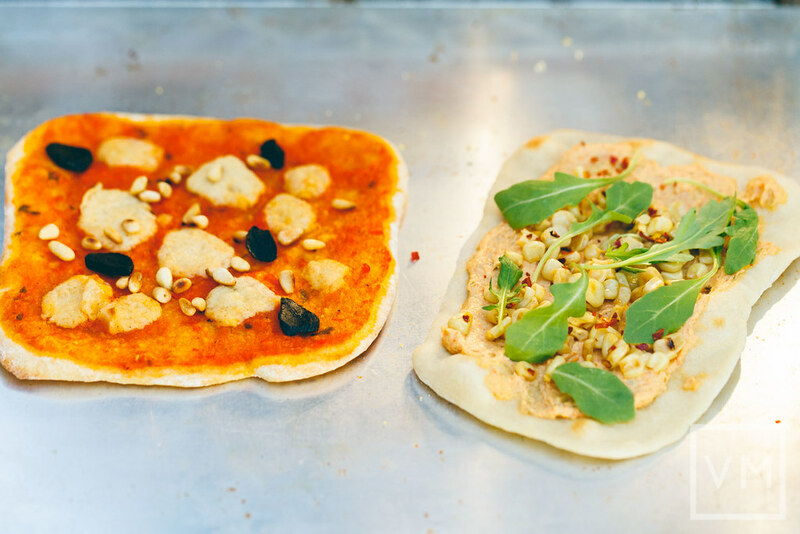 Spread on a crust before or after baking, and top with fresh or roasted seasonal vegetables for a delicious pizza. 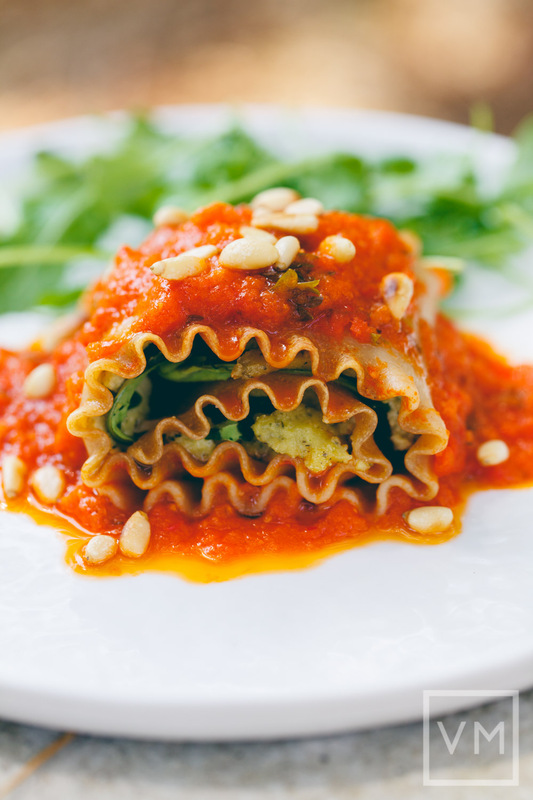 Layer with pasta and bake to make a lasagna. One of the most practical cheeses for cooking but also easy to enjoy as a spread or a dip. You can also use these cheeses for any recipe that calls for ricotta. 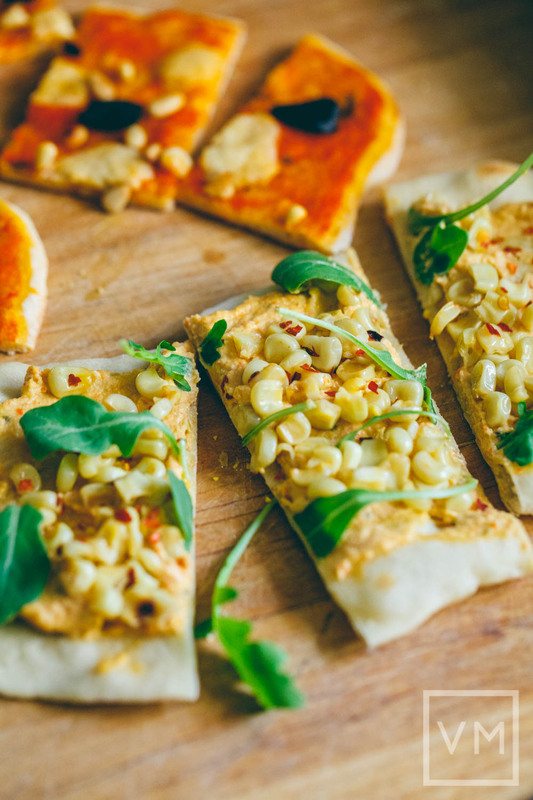 We used the Red Pepper Surrise on our beer flatbread pizza and topped it with spicy corn and arugula. 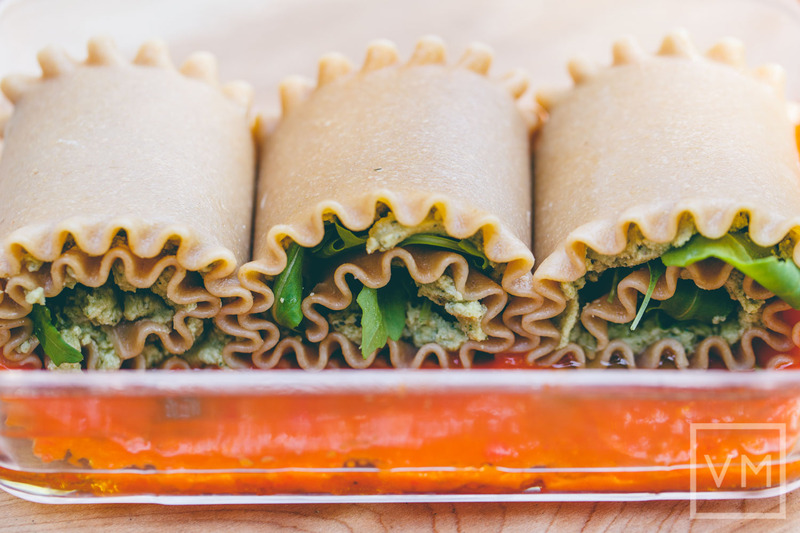 We made mini lasagna rolls filled with Creamy Basil Borealis, fresh basil and arugula and smothered in our homemade red pepper sauce. This was one of the best meals we made all summer. We enjoyed Vtopian’s newest wedges. They are good on pizzas, sandwiches, salads, spread on crackers, mixed in your creamy dishes and can be baked or combined with sauces. We’re just incredibly pleased with the versatility of these cheeses. All wedges are 6-ounces, contain soy and are gluten-free. This was our favorite from the new wedges. It was creamy, smooth and had a fine balance of sweet and savory with delicious little bits of organic caramelized onion inside. The onions inside reminded us of an onion bun or a bialy. 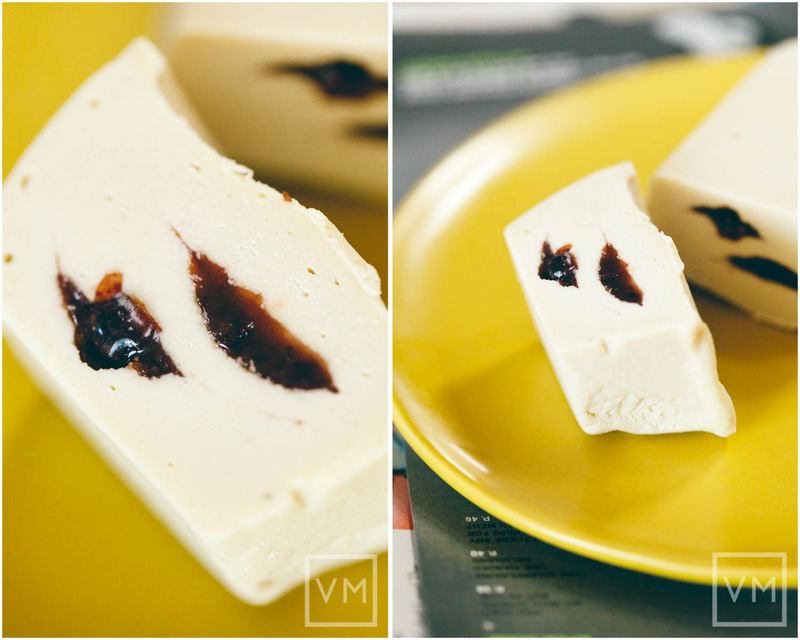 In addition to the onions inside, this cheese is topped with an irresistible balsamic glaze. We tried Caramelized Onion Camembert with water crackers and found the creamy consistency and rich flavors made for a perfect snack. This is the perfect cheese for a cheese board. This cheese contains organic chives and dill. With a similar consistency and flavor to the camembert, I really only picked up the dill flavor. If this had a more pronounced chive flavor and a bit of garlic, I think I would really love this cheese. As it is, the Chives & Dill cheese was nice and pairs well as a spread for a sandwich or a burger but wasn’t my favorite from the four wedges we tried. Lovely texture, mild flavor and so many potential uses. The Macadamia & Cashew Camembert is described as being a ‘rich, creamy, semi-hard cheese.’ What we loved was the creamy-crumbly texture that resembles a goat cheese. We broke this wedge down by hand into small chunks and scattered them on our flatbread with homemade red pepper sauce, toasted pine nuts and black garlic. This is one cheese that makes a lovely topping for baked dishes. Broken into big chunks, in a baked dish this cheese dried out nicely on top but still retained a soft-creamy interior. 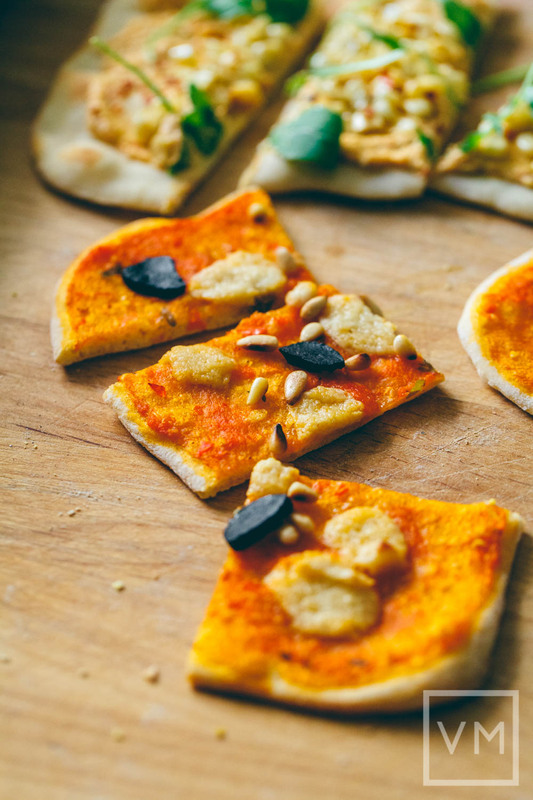 Beer flatbread with Macadamia & Cashew Camembert chunks, homemade red pepper sauce, toasted pine nuts and black garlic. The Reserve Sharp Cheddar has a robust cheesy flavor that’s deliciously savory served fresh from the fridge as a snack or added to any cooked recipe. This Vtopian cheese is smooth, creamy, flavorful and held up well under the heat to form a nice creamy, cheesy crust on our Vegan Petite Jalapeño Cornbread Loaves. We love the flavor and versatility of this cheese. Great for sandwiches, burgers or anything else you would typically add cheddar to. Vtopian has 5 brie flavors, all are available in 6oz bricks. Vtopian bries are cashew-based, gluten-free and contain probiotic cultures. All are soy-free with the exception of the Dark Chocolate Strawberry Brie ( a small amount of soy in the chocolate). The brie cheeses are moderately creamy, firm enough to hold together and slice but still soft enough to spread. The five brie flavors available are Cranberry Brie, Raspberry Brie, Dark Chocolate Strawberry Brie, Peppercorn Brie and Sundried Tomato Brie. Cranberry Brie and Raspberry Brie are very similar. Both are filled with thin fruit sauces and while the sauces have lovely flavor, these cheeses occasionally seemed like they were lacking a bit of filling. The fruit cheeses would have been even better with chunks of berries mixed into the cheese. The Dark Chocolate Strawberry Brie is also similar, with a thin strawberry sauce filling, but it’s topped with dark chocolate and freeze dried strawberries. The Peppercorn Brie and Sundried Tomato Brie are the two savory and more traditional flavors. The whole rainbow peppercorns really packed a lot of flavor and the tomato brie had a rich, concentrated tomato taste that paired well with sandwiches and burgers. We didn’t attempt to cook with these cheeses but we did melt the tomato cheese on some burgers and found it to be very soft, moist and a bit messy when it was warmed up. The Vtopian brie cheeses are the perfect cheeses for snacking or spreading, this is mostly due to the flavors but also the consistency. It was a real pleasure and quite the indulgence to finally get to try Vtopian Cheeses. In a short amount of time they have managed to expand their line to include a variety of new cheeses. 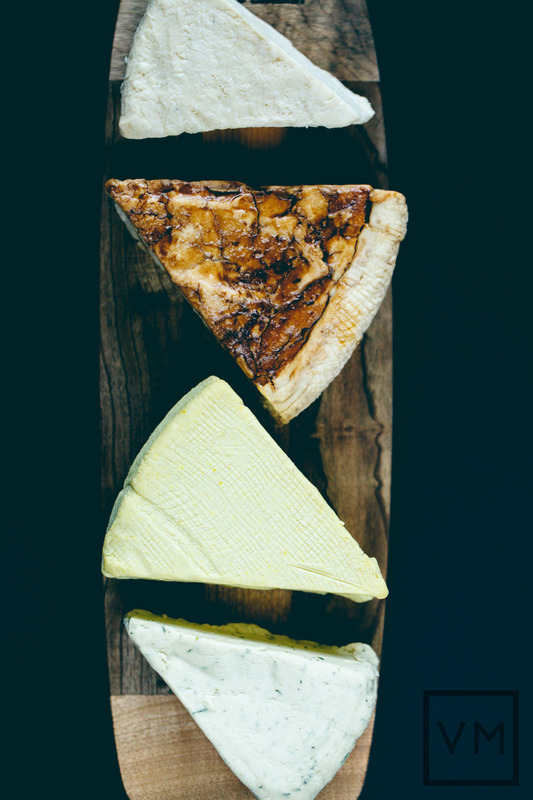 We would love to see the selection of wedges expanded because these cheeses were the most unique and the most versatile. The bries were similar to cheeses I have made at home, but available from Vtopian in a variety of fun and unique flavors. I can’t say I am huge a fan of fruity cheeses, but for those who enjoy the combination of fruit and cheese, they’ll likely appreciate these options. Our personal favorite from Vtopian was the Maple Seitan Cheeseball. 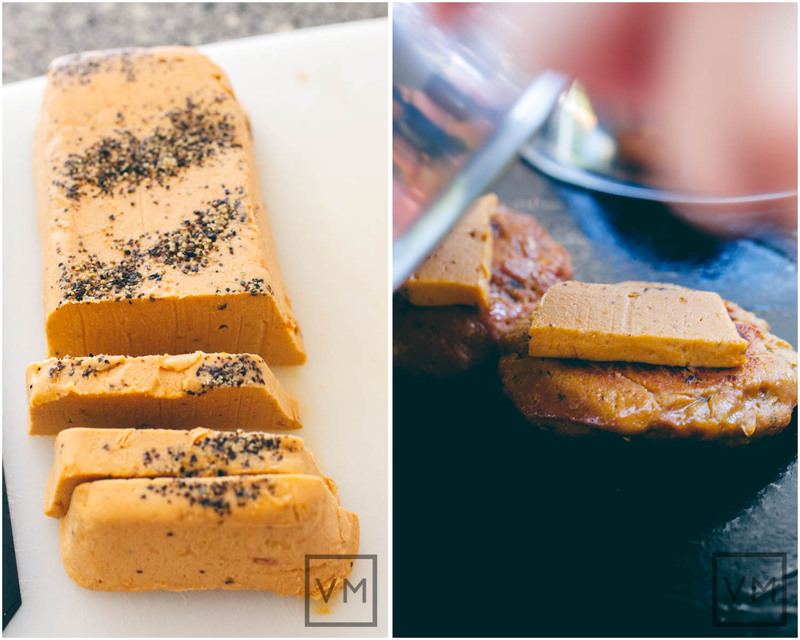 The soft and creamy cheese filling paired with the sweet and salty exterior of nuts and mapled seitan was pure decadence and an ideal snack to share with guests. We would like to see some more spicy cheeses, currently there’s only the Spicy White Cheddar that we have yet to try. Later this year we will be sampling and reviewing the three cheddar bricks available from Vtopian. 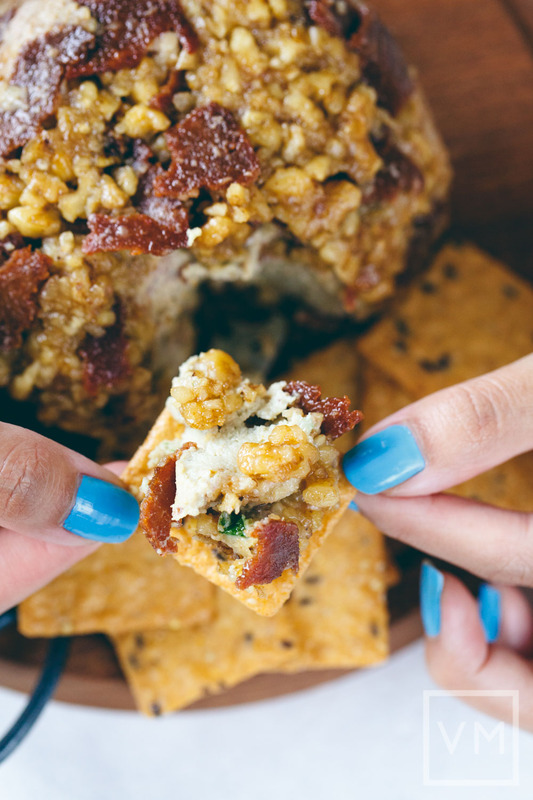 Are you a fruity or savory cheese type? Have you tried any artisanal nut cheese before?